Unfortunately not all essential nutrients can be made by the horse themselves, and a changing diet could bring about an imbalance in certain Essential Fatty Acids (EFA) that are required for the horse's wellbeing. PureFlax contains a perfect balance of Omega-3 and Omega-6, which if lacking can affect the horse's temperament. 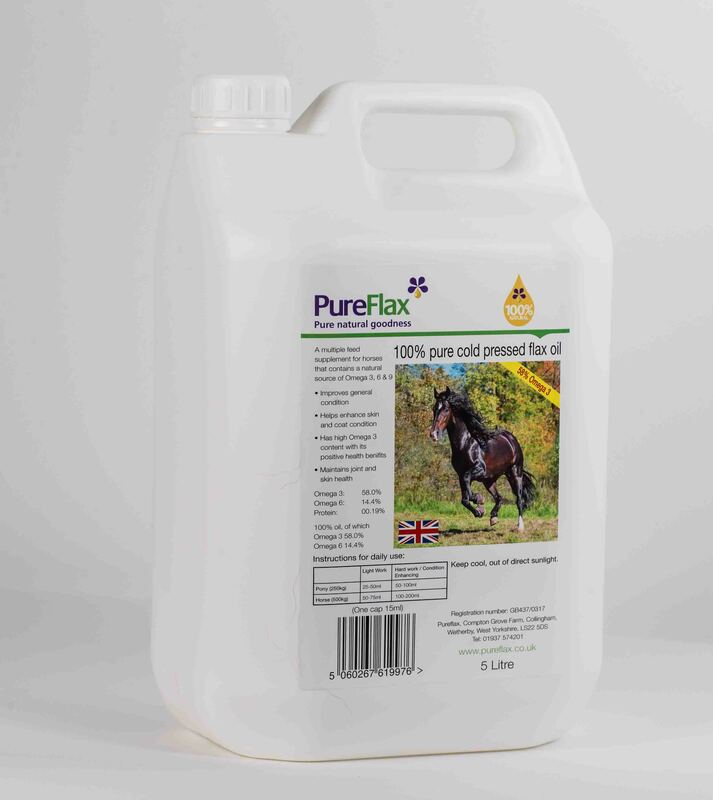 PurFlax Flax Seed Oil is an easy to digest supplement which helps maintain strong hooves, glossy coats, joint and skin health, and an all-round better condition. It is also an important digestion aid and can reduce a lactic acid build up in the muscles, which commonly causes fatigue in performance horses. PureFlax Flax Seed Oil is produced only in Yorkshire, from growing of the crop to the cold pressing of the seed. There is absolutely nothing added to this process, hence this being a 100% natural product with 58% Omega 3. For PureFlax Flax Seed Oil for dogs, click here. Aids broodmares with regular fertility cycles and health of the foal prone to infections. This is the recommended amount to of flaxseed oil to feed your horse or pony each day. Below are some recent questions we've received regarding PureFlax Flax Seed Oil for Horses, including answers from our team. Does the 5l bottle come with a dispensing pump? This product does not come with a pump. This is suitable for laminitics, so your pony will be fine using it. Is flaxseed another name for linseed..?? Yes, Linseed and Flaxseed oil are the same thing- obtained from the seeds of the flax plant. Is this product likely to cause weight gain? My mare is already overweight. This is a relatively high energy supplement and so theoretically could contribute to weight gain. However the overall energy content is not high compared with the total energy intake of a typical horse and so weight gain should not be a problem if the diet is otherwise appropriate. A high fibre/low energy diet should be your aim generally, then this supplement could certainly be included.